Homewares shop on North End. It opened some time between June and August 2018, and seems to primarily sell rugs, giant vases, and display cabinets. According to a photo on Flickr, as of c. 1990 the premises were occupied by a branch of H Samuel. By May 2012 it was a clothes shop called Portre photo, but this closed some time in August or September 2014. As of October 2014 there was a bailiff's notice in the window dated 18 September 2014 stating that the owner had taken repossession of the premises photo. Another notice photo stated that the eyebrow threading concession that used to be there had moved to Cianna at 11 St George's Walk. By December 2014 it was open again, still under the name Portre, though not necessarily under the same management. This closed again some time between July 2015 and November 2015. 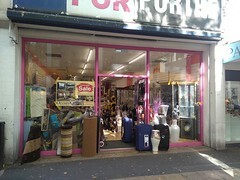 As of late November 2015 the premises had been stripped of stock and were being used for one of those one-or-two-day "bargain" sales with people with loudspeakers selling boxed branded goods "on the cheap". By early January 2016 it was stocked with clothes again, and once more trading under the name of Portre photo. By November 2016 it had started also offering mobile phone sales and repair under the name "mobilefonedoctor" photo. However, both Portre and mobilefonedoctor closed down some time between October 2017 and June 2018. Last edited 2018-08-14 18:52:58 (version 46; diff). List all versions. Page last edited 2018-08-14 18:52:58 (version 46).